These are just the highlights in the big ops undertaken by the forces. In his command centre inside Dehradun's Jolly Grant airfield, Air Commodore Rajesh Issar, a lanky officer in olive green flying overalls and matching Ray-Bans, firmly speaks out words of encouragement to one of his pilots. "I will back you guys," he says over a satellite phone. On the afternoon of June 25, Issar, a helicopter pilot with over 8,000 flying hours and task force commander, reached deep within to motivate his pilots. Just an hour earlier, one of his Russian-built Mi-17s slammed into a hillside killing its entire five-member flight crew, six ITBP personnel and nine NDRF personnel. The crash was the worst setback to a gigantic armed forces rescue effort. Issar had to staunch the pall of gloom that spread over the National Technical Research Organisation drone base, now the nerve centre of a massive air rescue. "The chief has given a statement and he means it," he says. "We will not stop flying." Just the day before, Air Chief Marshal NAK Browne delivered the catchline for a well-oiled efficient rescue machine, over 7,000 armed forces personnel who worked tirelessly and efficiently to reach out to thousands of stranded, washed-out tourist-pilgrims stranded on the higher reaches of the valleys, slowly running out of food and hope. "Our helicopter rotors will not stop churning till such time we get each one of you out. Do not lose hope and hang in there." As politicians squabbled and cleaved relief efforts along political lines, for the stranded pilgrims the most heartening sight was that of whirling blades and men in olive green fatigues. The armed forces had performed spectacularly during the Bhuj earthquake in 2002 and when the devastating tsunami struck southern India in 2004. But the Uttarakhand deluge presented a complexity that boggled them. The floods had severed the ribbon-like roads that wrapped around mountains. Entire districts had been marooned. Over 30,000 people stranded. The rescue could take weeks. The forces speedily adapted combat techniques designed to operate in hostile territory for disaster relief. 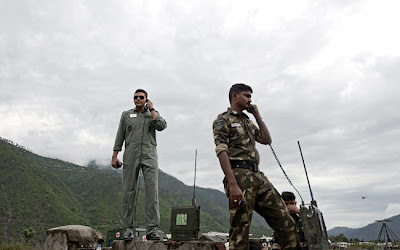 Lt-General Navtej Singh Bawa, the general officer commanding the Uttar Bharat area, moved his headquarters from Bareilly to Dehradun, equidistant from all the flooded valleys, on June 18. His patrols of between 10 and 20 soldiers swiftly turned into rescue and relief nodes. His directives to the troops were threefold: Search for marooned people, bring them to a safe place and provide them food and medical care. "If my men have reached, there is no question of anyone dying," Lt-General Bawa said. It was however only on June 21 that the magnitude of the tragedy became apparent. The IAF increased its helicopter strength from five helicopters to 45 machines, pulling them from bases as far away as Sulur near Bangalore and Bagdogra in West Bengal. The Army brought in 13 helicopters including Dhruvs, Cheetahs and Chetaks. Twenty-two private choppers, many flown by retired Air Force and Army pilots, were also brought in. The forces decided to use one of India's largest helicopter rescue efforts to build air bridges. The concept appeared simple on paper, but where would the machines land? The state government had ignored a three-month-old request from the Army to build a helipad at the Hemkund shrine. 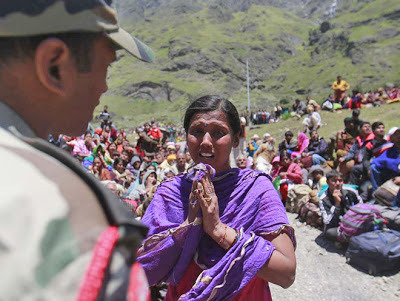 The Army wanted the helipad to evacuate pilgrims in an emergency. Now, there was no time to lose. Nearly 150 commandos from the Army's parachute regiment slithered down in areas where knots of survivors had been spotted. The commandos used knives and explosives to hack out three rough helipads for light rescue helicopters like the Dhruv and Cheetah to land. The pilots flew in the worst flying conditions imaginable-over mountains, in poor weather and through treacherous valleys. "One valley could be perfectly clear, the other one could have a cloudburst," a pilot explains. The effort spanned over 40,000 sq km and included over 50 helicopters and seven aircraft across the flood-ravaged mountainous state. "This capability has not been built overnight," an Army officer explains. "It took us over 350 years to get here," he says harking back to the Army's origins. On the ground, this capability played out with clockwork efficiency. Time was short and the orders were terse. A typical one-line order from a senior officer would read like this: 'Report to me from Sonprayag at 09.00 hours tomorrow.' The implication: An entire Army unit headed by the officer would have to be in place handling relief operations in the marooned valley. 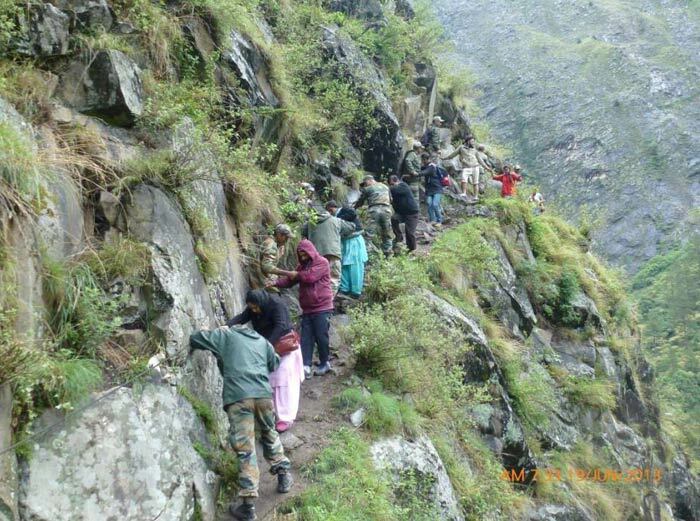 At the Nehru Institute of Mountaineering on the riverbank of the Uttarkashi, the principal Colonel Ajay Kothiyal, a mountaineer and gallantry award-winner, swiftly deployed his staffers and local youth, over 60 people, to rescue thousands of stranded pilgrims and tourists. "Our greatest asset was the young people of the district who we used in the relief teams as they knew the terrain well," he says. When it looked like the air effort would be overwhelmed by the sheer weight of people, the Army began opening roads to rescue survivors. Troops built 'Burma bridges', narrow rope bridges that allow people to cross over gorges in a single file. In Jungle Chatti and Govindghat, where such bridges couldn't be erected, Army Cheetahs flew nearly a 100 one-minute hops across a gorge, ferrying stranded pilgrims. 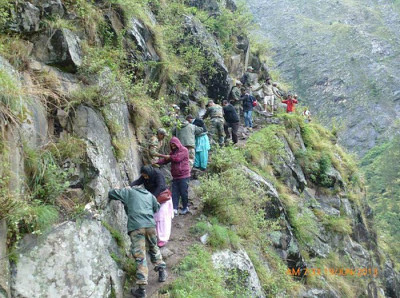 Between Jungle Chatti and Gaurikund, troops of the Sikh regiment formed a 3.5 km human chain where they hefted marooned pilgrims on their backs through hazardous terrain. A kilometre away from Gaurikund, an Army helicopter spotted nine bodies on a riverine island. The pilgrims were alive, but only barely. They had passed out from sheer hunger. They were administered saline drips and flown to one of five 'forward mounting bases' at the furthest points of washed-away roads from where medium-sized Mi-17 helicopters carrying 30 people could operate from. This unique air bridge leapfrogged survivors into the relief hub in Dehradun. 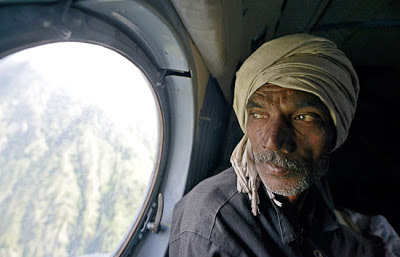 The most daring rescue was at Jungle Chatti, an area on the route towards Kedarnath. Army helicopters located what they thought were around 80 tourists stranded on a steep hillside. A group of 18 Army commandos were lowered to provide them with aid. This was when they discovered how wrong the estimates were. 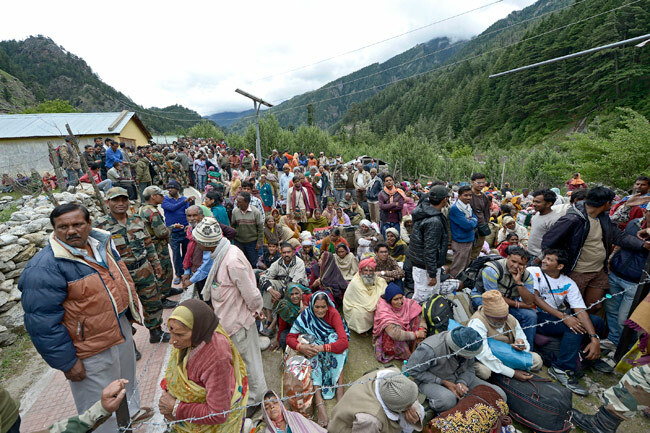 "Sir," an officer radioed Lt-General Bawa back in Dehradun, "there are between 800 and 1,200 people stranded here." Jungle Chatti was swarming with survivors who had scrambled up the hillside to escape the flood. They had not eaten in five days and now looked towards the helicopters for succour. The armed forces launched a complex operation the following day. Most people were flown out using helicopters, the able-bodied survivors were moved out on foot. The relief effort was not without external pressures. Central command officers were deluged by requests from "high ranking Centre and state officials" asking for certain persons to be evacuated first. One officer reads out an SMS template he kept to deal with such requests: "Kindly don't embarrass us. We are going as per the priority list: sick persons, old people, ladies, children, followed by other people." The Army was the last line of defence but used as the first option when disaster struck. The air bridge cut through the miasma of corruption on the ground. One family rescued by the Air Force recounted how policemen on the ground demanded bribes to allow them near civilian choppers. The police melted away when an IAF chopper arrived. Businessman Sudhir Kumar Gupta, 40, lost his three-member family in the flood at Kedarnath. "I survived only because of the Army," he says of his helicopter rescue. 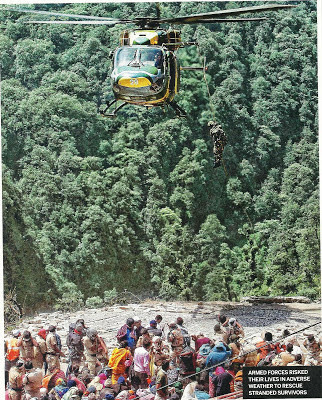 After 10 days of non-stop rescue sorties, over 22,000 tourists and locals were saved by the armed forces. Sugandh Chand Jain, a 55-year-old homeopath from Gotegaon, Madhya Pradesh, trekked to Badrinath with his nine-member family and insists he saw divinity. "They are angels," he says of his rescuers in uniform. The armed forces take such accolades in their stride. "This operation fulfils our constitutional mandate of aiding civil authority," says Lt-General Bawa. "I am happy we could do it with the speed and safety of our men and the people we were rescuing," he smiles.